Why do people feel comfortable with repetition? Why visit a fishing spot again and again, year after year, and look forward happily to seeing that spot? Afterall, the water travels over the same terrain and bends and curves in the same places, making the same subtle and rushing noises, and that sameness can be extended to the vista, the State Park, the campground, and the beauty. Within the sameness, there is always something new, something unexpected, something refreshingly different. So even though there is comforting familiarity with a place, a surprise always awaits even if it is a subtle one. Oh how I adore October, and 2010's October proves continually to be one of the best ever for me! 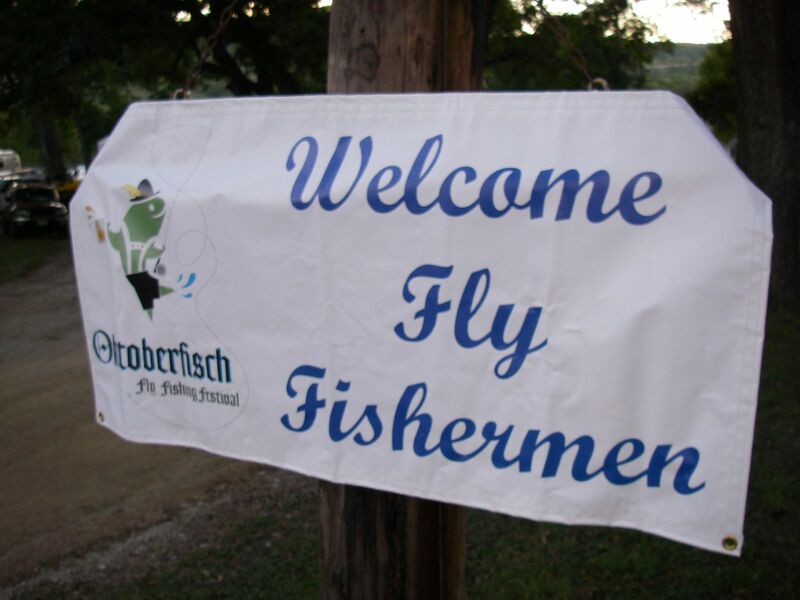 We spent part of our honeymoon fishing the Fredericksburg Fly Fishing club's annual Oktoberfisch on the South Llano River. We chose to camp at the Shady Morgan Campground, instead of cabins farther upstream. Jason's new girlfriend, Dawn, accompanied us this year, and Diane provided casting instructions to all who were interested. Dawn and Jason spent Thursday night at the ranch with us, so we introduced Dawn to fly-fishing at the Catfish Pond, where Dawn hooked-up with several Bluegill. 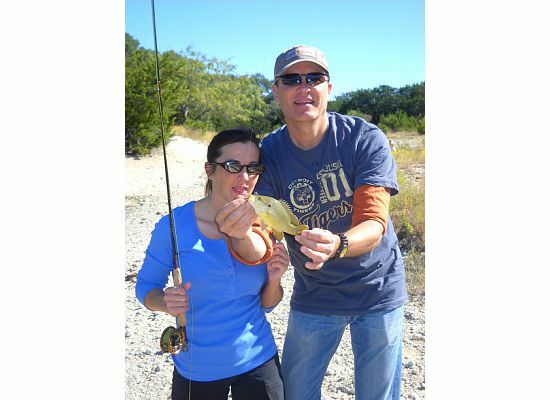 Holding true to a fine tradition, Dawn kissed her first catch with assistance from Jason. 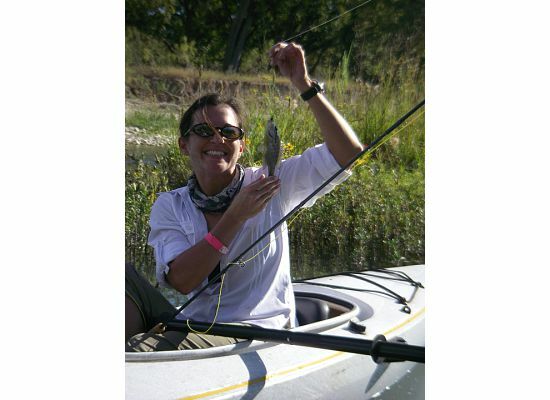 Having attended Diane's casting class and hooked-up with several fish, Dawn readied for her kayak lesson. Believing their is no better way to learn than baptism-by-fire, we showed Dawn paddle strokes and how to hold her paddle, and then put her in the kayak. We used the South Llano River State Park's river access as our put-in point, and Dawn paddled around while we assisted one another in getting launched. Somewhat disappointed by the lower-than-normal water levels and heavier-than-usual traffic on the five-mile stretch, the South Llano still provided gorgeous scenery, beautiful fish, especially a healthier Rio Grande Perch population, and plenty of pools in which we threw our flies. Jason spent time teaching Dawn casting from the boat and making sure Dawn was comfortable with the kayak, the rod, and the water. Much to all of our delights, Dawn loved fly-fishing, and, using a top-water bee fly pattern, even hooked up with a Longear Sunfish on her own. Cody built my own anchor, and I loved using it. I could hold in positions that in previous years weren't possible. As a result, for the first time, I fished a beautiful, tree-shaded curve just after the bridge at the state park, that has always looked fishy, and I was rewarded pleasantly so with a beautiful Rio Grande Perch, one of my favorite freshwater fish. Cody used the pontoon boat this year, but unlike Jason and I in years past, it didn't seem to kill him. 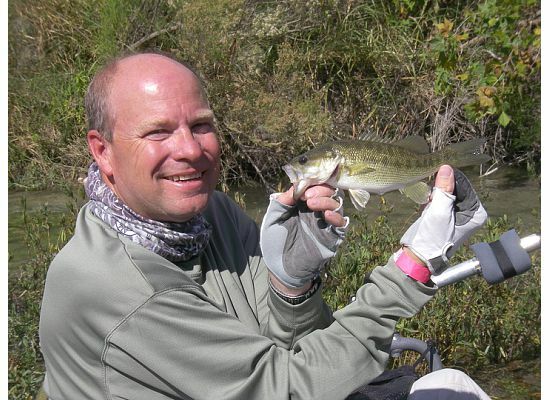 Cody picked his spots, nailed his casts, and landed some beautiful Guadalupe Bass, Rio Grande Perch, and Sunfish. A Blue Heron did take offense to Cody, for some reason, and pooped all over his boat; fortunately, the Heron spared Cody. We look forward to more fishing trips together and a wonderful anniversary trip back to the South Llano River and Oktoberfisch in 2011.